This year's Sweater Party didn't disappoint. There was an abundance of food (especially cheese), a good turn out of guests, and the Christmas carols were put on pause for a bit to pump Pirate Metal. Before the bad sweaters made their debuts, John's friends from work joined us for a 'Wild Game Feast', something that they have done for at least two years now. We feasted on duck, goose (both hunted and prepared by one of our groomsmen), moose sausage, black eyed pea fritters (delicious), and roasted root vegetables. I made cornbread (I'll post the recipe later, it was the best cornbread recipe I've used to date), and ciabatta. John bought an ostrich egg. It required a power drill to break the shell. 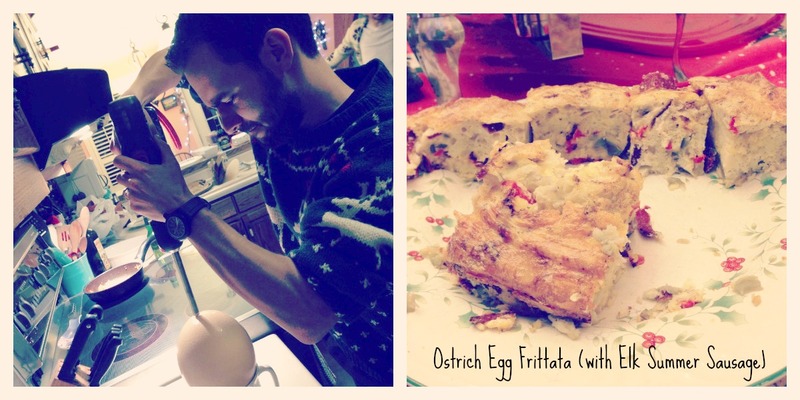 The end result was a delicious frittata which John added elk summer sausage to as well. It was really good and there was more than enough egg to feed all of us plus leftovers. My cake-expert friend Danielle provided the cake - a sinfully good 5 layer red velvet and mascarpone cake, designed to look like Santa very ungracefully coming down the chimney. And of course, being so crafty, my sister and I both made our own sweaters. By cutting out felt, and in her case, attaching lights for added effect. Now only one week to Christmas Eve!